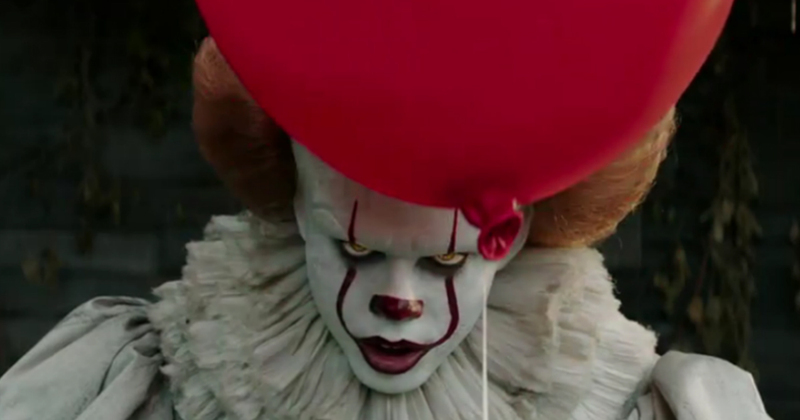 We’re never going to look at red balloons in the same way again, as the new trailer for the upcoming remake of IT is here, and it’s absolutely terrifying. As if we weren’t creeped out enough by reports of IRL clowns terrorizing neighborhoods, the trailer for the upcoming remake of Stephen King’s IT debuted, and we got TOTALLY freaked. The clip, along with this picture of Pennywise the clown, is the stuff of nightmares, and even this remixed trailer featuring The Cat in the Hat was absolutely horrifying. And if that wasn’t enough, it seems that the film is going to be split into two parts, so we’ll have double the chance to be scared out of our minds. Now during last night’s MTV Movie & TV Awards, another trailer for IT was released, and it’s even more terrifying than the first. The clip sees the boys from The Losers’ Club exploring a tunnel that leads to the sewers, and it also features a terrifying look at Pennywise. There’s also a creepy appearance of a red balloon and the sneaker of missing girl Betty Ripson. Watch the trailer below. Following the trailer’s release, people on social media totally freaked out. Based on the 1986 horror novel of the same name by Stephen King, the new version of IT is being directed by Andrés Muschietti. The new two-part movie follows the 1990 miniseries adaptation and will hit theaters on September 8th.